Caterpillar 3406E, C15, & C15 Acert engines all use the same style cylinder head, injectors, and injector cups (see images 1 & 2). The injector on these engines seats directly against the cylinder head casting, not on the injector cup. 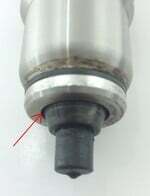 The seat is located below the injector cup and should completely seal the cup from combustion pressure and heat. (see images 3 & 4). 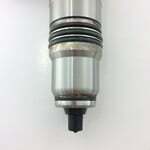 The injector doesn't actually even touch the injector cup. One issue with this design is that it is possible for the injector not to seat completely against the cylinder head. This may be due imperfections in either the head casting, the injector, or both. If the injector to head seat does not sealing it will let engine cylinder pressure go past the seat and pass in-between the cup and injector. When this happens the the cylinder pressure and heat can now reach both the injector o-ring and the upper injector cup o-ring. 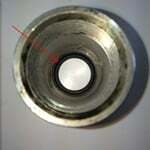 These o-rings will then fail as they were not designed to withstand the high cylinder temperatures and pressure. 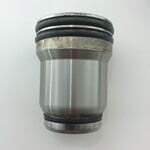 Carbon buildup or tracking on the inside of the injector cup or on the injector body above the sealing line (see images 6 & 7). 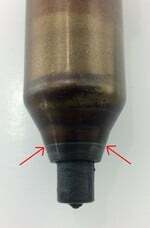 Traces of coolant or leaking coolant around the injector cup. 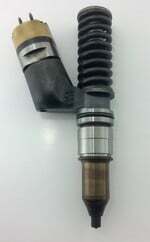 The injector body is worn, warped, or damaged. 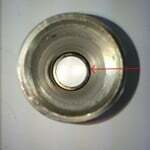 The cylinder head casting is worn, pitted, or otherwise damaged. The injector hold down bolts were improperly tighted or stretched.